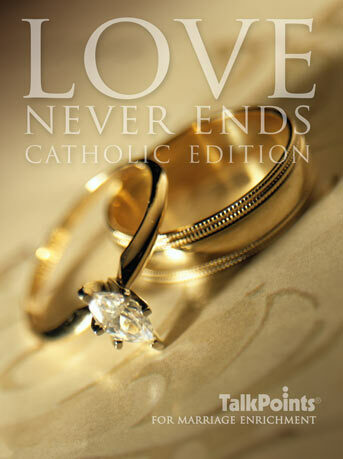 This book is being used by Worldwide Marriage Encounter and is a great resource for any Catholic couple or group of couples who want to deepen their communication, love and faith in marriage. 10 talks that renew marriages. The talk sheets are removed from the book and guide the talks. Useful tool in marriage counseling. Worldwide Marriage Encounter uses it. 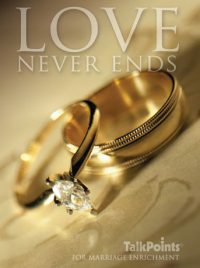 What are pastors and couples saying about Love Never Ends? What do couples say after using TalkPoints? Fun. I enjoyed hearing my husband’s answers. Very rewarding to our marriage. Enlightening, a pressure free time with my spouse. Helpful. With a small child, it helped us remember us. A good way to discuss difficult topics. I liked sharing memories with my husband. I liked the short answer format because it gave me a chance to focus on my own thoughts first. I liked the idea of an intimate sharing time. It was quality time together. Helped us to focus attention on each other which is tough to do with busy schedules. Helped us to openly communicate. Helped us to start communicating again. We understand each other’s expectations and beliefs better. An excellent way to provide a starting point for a variety of serious topics. It was thought-provoking without being too deep. It deals with issues that are important for every marriage. It’s a good way to learn more about each other. Helps people think about things, then share with another. It forces good communication in a nice way. It’s a good opportunity to express thoughts and feelings. The TalkPoints helped us to communicate with each other. We loved it! With the power of good communication, love never ends!